I have a second short-series for you in video format! It centres around the construction of a “simple” stand for rolls of paper towels commonly found in most kitchens, with an octagonal theme. I’m also hoping that I’ll be able to keep this one down to only a two-part series, with the conclusion to follow later on this week (most of it’s been filmed; it just needs to be cut and spliced together). Another fairly straight-forward build but, as always, comments are very welcome (don’t worry – I’m already well aware of the fact that my everyday voice lacks enthusiasm! :roll:). I’ve tried to take on board some of the points that Stuart commented on after the second Cutting Board video so, feedback is always welcome. Have I gone a bit OTT with the scene changes? I would’ve updated this blog much sooner but, I’m having some “issues” with the Visual Editor in WordPress and, as yet, I have not found a solution or a cause for it… I have tried using several different browsers but, they all lead to the same end result. Have any other WordPress bloggers experienced similar trouble with new posts lately? Thanks for reading and, of course, for watching! When I first started woodworking at home, back in the summer of 2005, the very first piece I made was a simple ‘Craftsman-style‘ wall shelf in pine (Scandinavian, joinery-grade redwood). I took the plans directly from a book [The World’s Best Storage and Shelving Projects] and modified various dimensions in order for the unit to accommodate my stash of DVDs. Despite its garish appearance with the tung oil finish and the crudeness of some of the joints I used (particularly the beech dowels used to peg the shelves), this wall shelf made the move with me to my new home at the end of March this year. All in spite of the fact that, with a total capacity for forty-eight DVDs on each of the two lower shelves, it wasn’t long after the completion date that my DVD collection had over-grown [thanks, Play.com and CD-WOW!!] and I was having to stack cases on top of the unit to try and keep things ‘organised’! 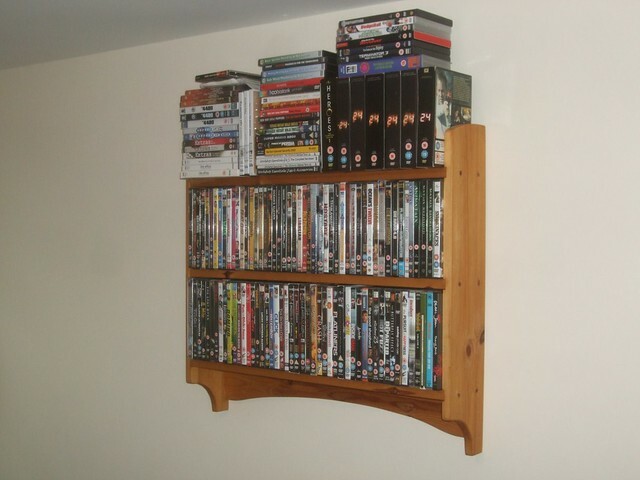 One Shelf... Too Many DVDs! It’s taken me almost six-years to make this decision but, I’ve decided now that the time is right to build a new wall shelf with increased capacity!